Update 2018-12-21: GA-EPD daily online Sewage Spill Reports! Update 2018-12-14: Now plus a petition individuals can sign. 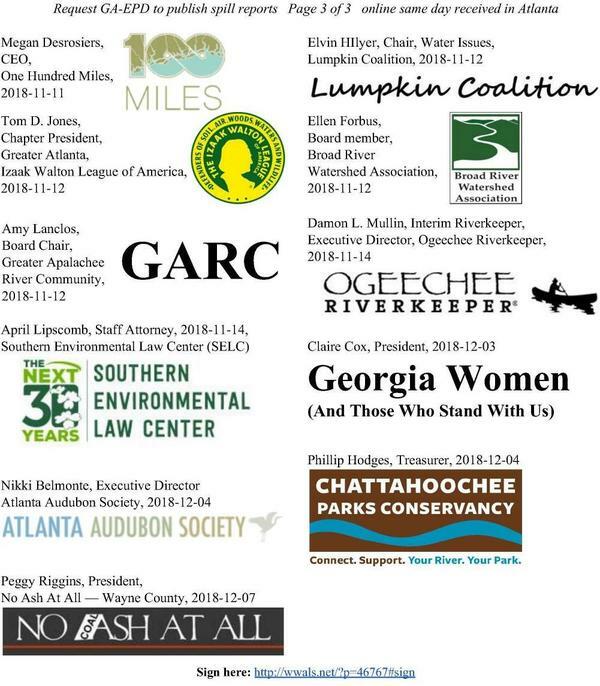 Update 2018-12-12: Four more Georgia groups make 31: Georgia Women (And Those Who Stand With Us), Atlanta Audubon Society, Chattahoochee Parks Conservancy, and No Ash At All—Wayne County. Florida groups: you can sign on, too, like some already have! This entry was posted in Quality, Testing, VWW and tagged 100 Miles, Aquiferious, Broad River Watershed Association, Chattahoochee River Program, Chattooga Conservancy, Collier County Waterkeeper, conservation, Cossa River Basin Initiative, Dana Skelton, Ellen Forbug, Elvin Hilyer, Emma Wheeler, Environment Georgia, fishing, Flint Riverkeeper, GA EPD, Georgia, Georgia Environmental Protection Division, Georgia River Network, Georgia Water Coalition, Glynn Environmental Coalition, GWC, Harrison Langley, Health, Izaak Walton League, Jacqueline Echols, Jen Lomberk, Jennette Gayer, Jesse Demonbreun-Chapman, John S. Quarterman, Laura Early, Lowndes County, Lumpkin Coalition, Margaret Tyson, Mark J. Wilson, Matanzas Riverkeeper, Megan Desrosiers, Michael Roth, National Pollutant Discharge Elimination System, Nicole Hayler, north Florida, notification, NPDES, Ochlockonee River Water Trail, Our Santa Fe River, permits, Peter North, public, public health, publish, quality, Rachael Thompson, reports, resolution, river, S. Gordon Rogers, sampling, Satilla Riverkeeper, Sierra Club, south Georgia, South River Watershed Alliance, spill, Suwannee Riverkeeper, Suwannee-St Johns Group, swimming, testing, The Trust for Public Land, Tifton, timely, Tom D. Jones, Upper Coosa Riverkeeper, Upper Oconee Watershed Network, Valdosta, VWW, Walt Ray, wastewater, watershed, WCTV, Whitey Markle, WWALS, WWALS Watershed Coalition, Yellow River Water Trail on October 30, 2018 by jsq.